When the day began, there was a weather report of a chance of rain could postpone most outdoor activities. With that news, most players might not even want to take the field. That's when the coaching staff must find a way to motivate their players preparing them mentally. It appeared that the Lady Eagles from Paul VI got the message when they were taking on the Lady Crusaders from Bishop Eustace in an Olympic Conference National Division softball game. 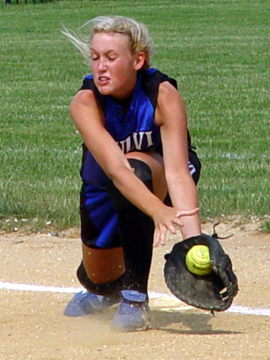 In a rain shortened game, starting pitcher Danielle Schafhauser would not allow a run to cross home plate and with the help of her teammates Paul VI would outscore the Crusaders 3-0 through five innings. Basketball is one of those sports that you can't let your emotions get the best of you. It's a quote you may or may not have heard, but when watching a basketball game the meaning becomes clear. The Washington Township Minutemaids were the underdogs at home against a very good Paul VI squad who has demonstrated their ability to score both inside and outside the three point arch. The Minutemaids would use their emotions to their advantage against the Lady Eagles overcoming an early deficit. Teamwork and a determined Allie Bassetti allowed Washington Township to stay one step ahead of their opponent and come away with an exciting 53-48 win at home. It was that time of the early when the traditional Thanksgiving football game could be found in your neighborhood. On Saturday at Paul VI High School, the Eagles were hosting the Fighting Irish in another one of those old time classic match ups. The Irish has had their way so far in their series against one another, but this was a different season for the Eagles. Paul VI would rely on their defense during the fourth quarter coming up with a key defensive play and maintain their three point lead. That's when Jonathan Grimes scored the final touchdown of the game giving Paul VI the 17-7 victory over the Fighting Irish. With the seedings for the upcoming state tournament already established, Camden Catholic's success during the regular season has rewarded them with a bye during the first round of the South Jersey Group II field hockey tournament. The start of this year's quest for the title begins tomorrow but the Irish still had a regular season divisional game to play against Paul IV. This was an opportunity for both teams to finish off the season with a good showing on the field. Camden Catholic would use this opportunity to prepare for the postseason and they did so by posting a 7-1 victory over the Lady Eagles. 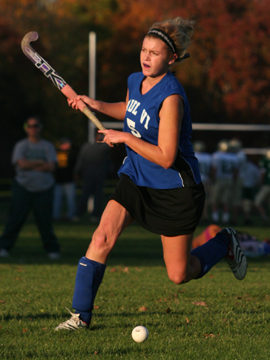 Kathleen Notos led the way for the Irish by scoring three goals. For six complete innings, starting pitcher Susan Jackman relied on her pitching, team defense and Seneca's offense in order to keep the Lady Eagles from Paul VI from scoring any runs. Lately, the Eagles have gained the reputation of never giving up in a game and making every game a close one. Seneca would slowly build a four run lead heading into the top of the seventh inning. Adding one more run and now with a five run lead, Seneca would watch Paul VI rally back scoring four runs. That insurance run during the top half of the seventh inning proved to be the difference as Seneca would go on and pick up their 5-4 victory. With the threat of a major snow storm on its way, the Paul VI and Atlantic City game would be the last game played in the Cape-Atlantic Challenge on this day. Inside the gymnasium at Timber Creek, this game provided enough entertainment that allowed most to forget about the inclement weather for the moment that was on its way. This tournament has allowed two teams from two conferences to match their talent against one another. The Vikings from Atlantic City have been labeled as one of the top ten teams in South Jersey. Paul VI would watch the Vikings lead at the break only to rally in the second half to send this game into overtime. The Eagles dominated the extra session and posted a 75-66 win over Atlantic City. It was a game that both teams had the confidence that they would be the winner of this game. No lead was safe and no deficit was too great to overcome when the Tigers from Woodrow Wilson traveled to Paul VI competing in an Olympic Conference National Division game. The Tigers would lead by a point with 15 seconds remaining in the game only to see Robbie Grant's basket and foul shot with 1.6 seconds remaining in the game push Paul VI's lead by two points. After a timeout, Woodrow Wilson would attempt a desperation shot from will behind the half court line but bounced off the ceiling rafters. Paul VI would extend their winning streak to nine games when they escaped with the 77-75 victory. There were a lot of reasons many showed up at Camden Catholic to witness a classic high school football game Thanksgiving morning. One reason would be to stay out of trouble with the chef of the house as temptations of sneaking a taste of the turkey dinner would bring on a slap on the wrist. 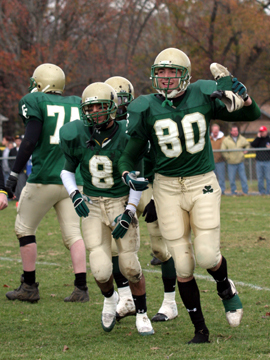 During the Paul VI and Camden Catholic football game, many players got a chance to play in front of visiting family and friends. As for the game, the Eagles would finally break a tie when place kicker Joe Owens kicked the game winning field goal with seconds remaining on the clock. 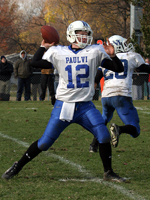 Paul VI would defeat the Fighting Irish 17-14 in a thrilling game. David Moore had two goals and two assists, Christian Biscardi scored twice and Sean Furman added a goal and three assists as Washington Township easily handled Paul VI, 8-0. With the victory Township moved into a first place tie with Moorestown and Cherokee, but Township has played more games. Moore and Furman traded goals in the opening four minutes of the game; first Moore put home a rebound of a blast by Furman from the circle. Then Moore sent in Furman thirty-eight seconds later and Township led 2-0. Drew Williams had two goals and an assist and Sean Swisher added three assists as Cherokee II skated by Paul VI 5-1 at Hollydell on Friday night. The night almost didn’t start out as well for Cherokee II as goalie Stephen Broadt was late arriving to the game and skated on the ice just as the officials had informed his team to skate with six guys. 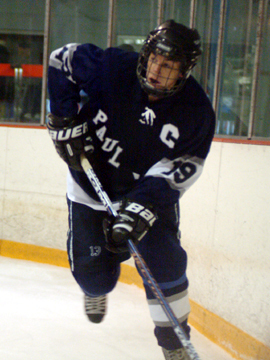 Mike Slusarz gave Cherokee II a 1-0 lead scoring right off the face-off five minutes into the game. Williams scored his first goal moments later on the power play on a feed from Swisher. Those two hooked up again late in the period on a 2-on-1 as Swisher drew the defenseman over and slid the puck to Williams and his shot found the net for a 3-0 lead. Camden Catholic's Michelle Vittese continues to lead her team in scoring and she would add to that total against the Lady Eagles from Paul VI. In an Olympic Conference and important National Division field hockey game against the Eagles, the Lady Irish needed just one more divisional victory to clinch the title. Seneca was that team in their rear view mirror looking to find a way to sneak up and tie Camden Catholic in the standings. But Vittese would score two goals for the Lady Irish to lead them past Paul VI by a 5-0 score.